Former U.S. 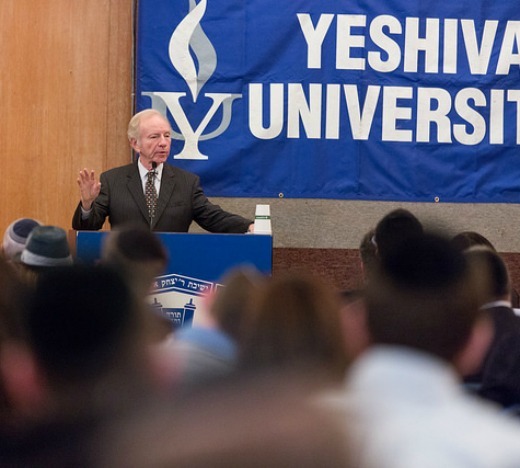 Senator Joseph Lieberman, the Joseph Lieberman Chair in Public Policy and Public Service at Yeshiva University, delivered his first talk of the semester to students, faculty and staff on October 19 at YU’s Wilf Campus. Titled “Torah, Halacha and American Politics,” the lecture was the first of a three-part series which will continue with addresses to students at the Sy Syms School of Business and Stern College for Women, and was presented by Rabbi Isaac Elchanan Theological Seminary (RIETS). Lieberman called his tenure at Yeshiva University “a great experience with very impressive students,” noting that his daughter had attended Stern College and that his son-in-law received semicha [ordination] from RIETS. Discussing the role Torah has played in American history, Lieberman said, “America is unique. It’s defined by its values more than its borders.” According to Lieberman, those values come from the Torah as much as from anywhere else: he referenced the book On Two Wings: Humble Faith and Common Sense at the American Founding by Michael Novak in describing how the American eagle “took flight with two wings: one wing from the enlightenment, and one wing from the Hebrew Bible.” He compared the United States to the Jewish people, both of which became nations upon receiving their defining values. Lieberman described how the first words uttered by Reverend William Brewster, the first person to leave the Mayflower, were from the psalm”Mizmor L’Todah,” and offered several examples of evidence of Torah influence over early Americans, including the fact that many pilgrims described their harrowing journeys as similar to the travels of the Jewish people across the desert. Torah also played a major role in shaping Lieberman’s career. Throughout his youth, he was very interested in history and was struck by the fact that leaders can have a great impact on history through action. Lieberman was deeply influenced to choose politics as a career by three biblical stories: the story of the meraglim [spies], the story of the yam suf [splitting of the Red Sea] and in Megillat Esther, when Mordechai instructs Esther not to lay back, because if she doesn’t act, someone else will save the Jewish people. Lieberman acknowledged that he is not the first observant Jew in politics, but noted that he is the first to be fully engaged in politics at a national level. He described how the “real intersection of observance was in the senate in observing Shabbat and yom tov.